I am in favor of people being aware and knowledgeable about their kashrut issues, and that includes proper labeling of kashrut on food items. In this situation, nothing was done wrong, but there is still room for someone to not notice the issue, and therefore I feel it important to point out. Tzabar salads make many different types of salads. Many of their salads have had a Badatz hechsher in the past (and still do). This is one of those situations in which you normally buy a specific product and dont check the hechsher each time - because you know it is acceptable to you. The problem with this is that when something changes, you don't notice it. 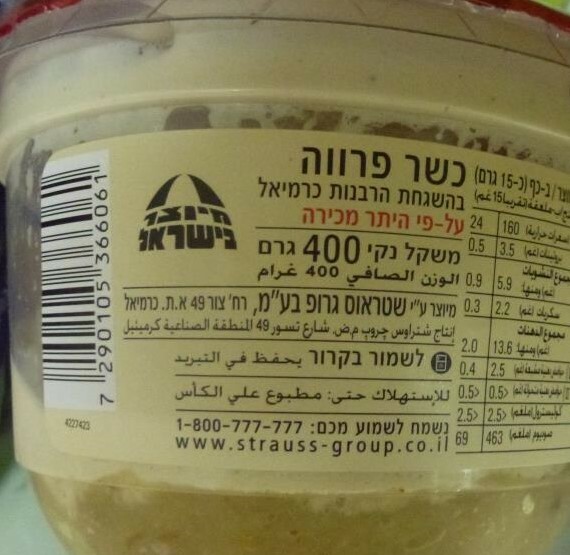 It has been noticed that many of the Tzabar salads no longer have the Badatz hechsher, but are sold with the Rabbanut hechsher and use hetter mechira produce. 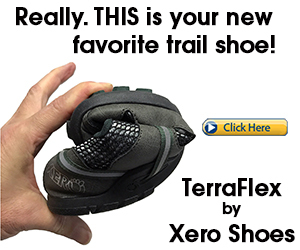 Again, the products are labeled correctly, but because of our behavior patterns, many people might not notice it. It has also been noticed that these salads are sometimes sold in stores where the shelves are labeled, and not all labels have been changed. I was told of a store that right under the containers of salad the shelf still said "Badatz Eida" but the salads were all hetter mechira Rabbanut. If you eat Rabbanut hechsher, and hetter mechira, you are fine in this situation. If you don't, than this message is for you. If you are looking to get a bracha from a major hassidic rebbe, or a mekubal, you might need some "protexia", you might be able to wait in line for a very long time, or you might not get in at all. That all might change very soon and it might sometimes become easier to get that bracha. Ben Gurion Airport has a little known administrative order known as "Nohal Ha'Admorim" - the Admor rules. These rules are applied to a list of rebbes, hassidic rebbes and mekubalim. When anybody on this list arrives on the airport, he can let the authorities know and he will be given special treatment. The Admor treatment is similar to the treatment given to anybody holding a VIP passport, but they still get one additional benefit. The Admor listed will be able to drive right up to the airplane and not have to wait in the terminal with everybody else. When he arrives at the airplane, a clerk will be present to perform the security checks, customs, and passport control. Also upon entry, he does not need to go through the airport, but will have everything taken care of in his private car right next to the airplane. According to Bechadrei, the list includes 45 rabbis. The "Admor treatment" was appealed to the courts on the basis of it treating a small select group of rabbis with special treatment. To be included in this list, there is no clear criteria and breaches all rules of order and equality. The Supreme Court heard the arguments and yesterday the Customs authorities decided to cancel the Admor Treatment without even hearing a decision yet from the court. An exception was granted for special situations in which a great rabbi comes from abroad and a large group is expected to greet him at the airport. They would be able to coordinate with police and possibly apply the special treatment and also allow the crowds to greet him. So, with the rebbes and mekubals having to stand in line with everybody else,your best bet for getting a quick bracha might be in fiding out their travel schedule and getting one while waiting in line with the rebbe at check-in. Some of the news websites are saying that Israel security services have found and killed (in a firefight) the suspected terrorist who shot Yehuda Glick last night. I don't understand the headline, and I assume it is the attempt at politically correctness of the relevant media that caused them to write it like that. If the guy is only a suspected terrorist, he should not have been killed. If he was killed "unintentionally", as a result of resisting arrest and starting a firefight, that should be pointed out. The headlines makes it sound like he was killed because of his involvment, but he was only suspected. Suspected terrorists should not be killed, though I don't have a problem with actual terrorists being killed. If he was the terrorist, and he was positively identified and there were eyewitnesses to the shooting so I'll go out on a limb and say that the identification was relatively easy, he should not be called a suspected terrorist. He was a terrorist. So was he a terrorist or a suspected terrorist? was he killed because of what he did, because of what he was suspected to have done, or because he started a firefight? It might only be semantics, but the story needs to be told correctly. In light of the scandal with Rabbi Freundel of the RCA and the changes being implemented by the RCA in response to it, Rabbi Pruzansky has announced that he will be stepping down from his position as head of the RCA's conversion court. Despite the fact that I did not always agree with his opinions, I feel bad he is stepping down and I feel it will be an overall loss for the RCA. It seems to me, and I never heard otherwise, that Rabbi Pruzansky is an honest and hard working rabbi with great integrity. I don't have to agree with everything he says, but it is a shame to lose someone like that from the system. He surely has given it honor and prestige and has done what he could to make sure the conversion court worked well. I love this superhero's name..
What does a Chabad bochur do when a Jewish man on a jog tells him he won't stop to do a quick Mitzvah. and so began the Crown Heights Marathon..
A proposed law is in the Knesset works, having passed its first reading today. The proposal would cancel any financial benefits (from the government) from students who evaded army service. According to official numbers, there are about 5000 service evaders annually. MK Yoni Chetboun (Habayit Hayehudi) is behind the proposal and said the IDF is the people's army and it is Israeli society's responsibility to rid itself of the phenomenon of service evasion. The proposal has broad support, with only 2 MKs voting against. It is expected to pass its final readings next week. I am not one to argue with Rav Shteinman, but this is just strange..
Ladaat is reporting that during the holiday of Sukkos, after the early rains, one of the UTJ askanim of Jerusalem went to Rav Shteinman. Among other things, this anonymous askan asked Rav Shteinman about the heavy early rains that caused people to not be able to eat in the sukka - many could barely even eat the minimum kzayis before having to run inside. As well, many sukkas were blown over by the strong winds. This askan asked Rav Shteinman in what we need to strengthen ourselves - what does this indicate as to what problems we are having? Rav Shteinman responded that because it affected the entire city, it is a public problem rather than a localized, personal problem. He then blamed the mayor, Nir Barkat, as the cause for the rains and winds preventing people from eating in the sukka. "when there is a mayor like that, everybody knows the reason". Perhaps Nir Barkat will be able to boast in his next election campaign that he was even able to bring the rain. I didn't know this existed. looks interesting..
looks like a good yeshiva..
Yesodei HaTorah: The Next Step from SERIO FILMS on Vimeo. Amare Stoudamire, he with the "Hebrew roots", is supporting United Hatzala. The way he says Hatzalah, though, sounds more like Godzilla.. nice video, and a great cause! ICQ??? he doesn't look old enough for ICQ!!! The Ministry of Education has come through with its new requirements for yeshivot to get funding for foreign students. A year ago the Ministry of Education announced that it will revoke the cancellation of the funding received for foreign students in yeshivot, but the funding will require yeshivot to give classes in Zionism and take the students on a certain number of trips to army bases and heritage sites. 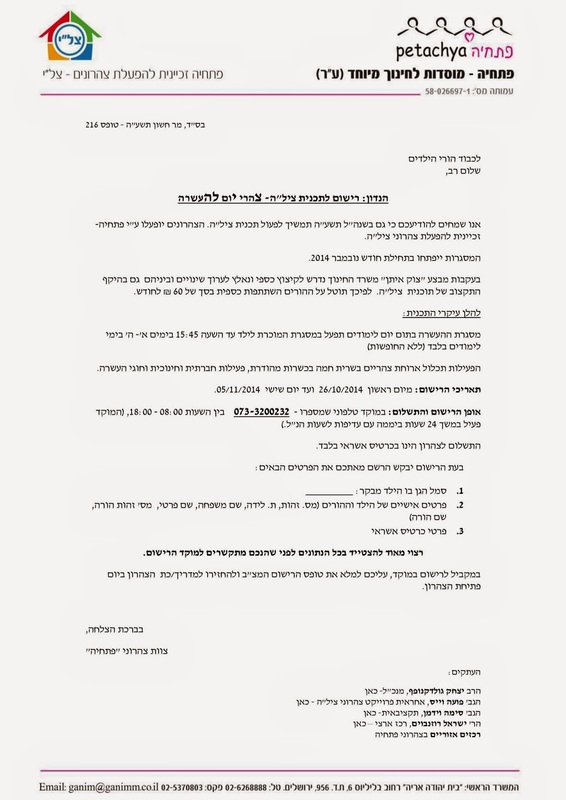 The Ministry of Education has now sent out a letter to roshei yeshivot and heads of institutions letting them know of the new requirements. for the governing offices, included are: Knesset, Supreme Court, government offices, local authority offices - it would have to be noted who from the office led the group and what was included. If a yeshiva wants to visit a site not included in the list, they can contact the Ministry and clarify if that site meets the requirements and can be counted. Obviously, the roshei yeshivot and askanim are upset at this intervention in the educational programs of the yeshivot. the heritage sites look pretty easy to accomplish. Most yeshiva guys go to most of those places anyway. And they are places the yeshivot should generally not have any problem with. The Holocaust Museums as well. the army bases and the government offices could be a problem. Yesterday the Knesset passed the first reading of a law that will allow a city rabbi to be fired. According to the law, if it should pass into law, will allow the Minister of Religious Affairs to fire a city rabbi if he is not performing his duties and responsibilities properly. The firing would have to go through a committee that will be made up of dayan appointed by the Minister, a city rabbi appointed by the head of the Rabbanut Religious Council, a legal adviser of a government ministry. If the committee will investigate and deem the suspicions valid, they will be able to recommend to the Minister to fire the suspected rabbi. Deputy Minister of Religious Affairs Rabbi Eli Ben-Dahan says this is necessary because there are such rabbis in the system but the system has no ways or tools to deal with them. This law will increase the level of trust the public has in the rabbis. Ben-Dahan also said this law was prepared in coordination with Chief Rabbi Dovid Lau. The Haredi parties do not like the law proposal. They don't like the possibility that a rabbi will be fired by a politician. MK Uri Maklev asked if judges have a similar system by which they can be fired. MK Yitzchak Cohen compared Habayit Hayehudi to Titus who destroyed the Beis Hamikdash. MK Aliza Lavie is dissatisfied for another reason - the committee is made up of men and they will protect other members of the club. Lavie wants the committee to include women. Ben-Dahan responded to the Haredi MKs saying that during the rule of Shas, there was a decrease in rabbis, while he, Ben-Dahan, has appointed 69 new rabbis, to date. As well, Ben-Dahan asked them why they are concerned to protect and defend rabbis who don't fulfill their responsibilities but continue to take payment. The first reading of the law passed by a vote of 54-11.
good luck to the Zivoovskys, from Bet Shemesh, who are set to have their suit heard before the Supreme Court again to force the US gvernment to use "Jerusalem, Israel" on passports issued in Jerusalem and births abroad registrations. The case has been through the courts for years, and this is probably the end of the line, one way or the other. One argument I have never heard is that supposedly West Jerusalem is not considered disputed territory, so even if the US administration position is accepted that the President should be ale to determine policy and this is affected by that, that should give them the right to not use ",Israel" in disputed East Jerusalem. Births in West Jerusalem should not be considered to be in a disputed area and should be registered as "Jerusalem, Israel". anyways, good luck to the Zivotovskys. to sum up the two tempests of the past day: Tel Aviv is concerned about touring in Jerusalem, because it is too close to the Palestinians, but is deeply shocked that the settlers are concerned about traveling home on the same bus as those same Palestinians. the annual Bet Shemesh 5km race to benefit the Benjamin Library is scheduled for Tuesday evening December 2, 2014 at 6:30pm (18:30) starting at the plaza of Neimi Mall. Head on over to register! it is a great, and fun, event. video from the 2013 race..
interesting report.. especially how connected it is to Christian missionaries..
Times of Israel is reporting that the terrorist who slammed his car into a crowd last week, killing people including a 3 month old baby, is having his funeral held up. The terrorist, who was shot dead, has funeral restrictions in place - Israel wont allow more than 20 people in attendance, people whose names have been submitted to authorities and pre-approved, as well as it taking place at 11pm. The terrorists family has decided that the terrorist deserves an honorable funeral and if Israel does not remove the funeral restrictions, Israel should just keep his body. I've got no problem with that. I don't think Israel should ever release terrorist bodies for family funerals with adoring fans playing up the martyr aspect. Israel should toss his body into the Mediterranean similar to what the USA did with Bin Laden's body. Or cremate the terrorist body and disperse the ashes into the air, or in a pig farm. What cards here do they think they are holding that they can threaten this? The Ministry of Transportation has come up with a series of rules for riding electric bicycles. The real problem is enforcement - it seems the various relevant authorities don't know how to enforce the rules or who is meant to be responsible for this enforcement. the Ministry of Transportation is working on a plan to improve enforcement. be safe. riding a bike [especially in the streets] can be dangerous, and must be done with caution and care. Riding an electric bike is even more dangerous, due to the speeds. I was backing out of a parking spot the other day, and checked all directions and saw the coast was clear. As I backed out, I caught, in the corner of my eye, some motion. I stopped and turned around and saw a teenager on an electric bike flying down the hill at high speed in the street, with no helmet, A moment later he passed right behind my car. Had I not noticed the movement in my peripheral vision and stopped, I would have smashed right into him (maybe he would have swerved or whatever to avoid me). True, that can, and does, happen with bikers, and even with pedestrians walking.. but with the speeds of these electric bikes, these situations can really be bang bang. If they are regulating the driving of these, I wonder if they will next also take on the driving of "bubby carts", or golf carts.... they don't go very fast, but if they are being used to drive in the streets, perhaps they should be dealt with in a similar manner. Much of our kashrut system, even with all the organizations, supervisors, systems, etc, is based on trust. At the end of the day, you are trusting somebody - whether it is the proprietor, the supervisor, the organization behind the supervisor, the guy behind the counter, a piece of paper on the wall. You are trusting somebody. Oftentimes you must be trusting more than one person, and I'll point out that these are generally people you do not know, in the chain. This is unlike the era before mass-production of food and the advent of food technology, and the formation of major kashrut agencies. Back then, there was only one person to trust. You did everything yourself or you trusted the person giving you the food. It gets complicated. and with trust, that trust is sometimes broken, sometimes taken advantage of. We occasionally hear stories about breaches in kashrut. The most famous in recent times is probably the scandal in Monsey a few years ago. Another might be the meal at the President's House in Jerusalem where they ran out of meat and a chef was caught having served treif meat he bought from Arabs when at the last minute he had to replace meat that went bad. Now there is another big one. Arutz7 has the story (I saw it in Mishpacha newspaper (offline) as well. Two kosher butchers have admitted to doctoring non-kosher meat and selling it to Jewish institutions for "years," German newspaper Juedische Allgemeine reported earlier this week, during proceedings against them in the Frankfurt District Court. Leslie W., 48, and his partner Akiwa H., 56, are being tried for fraud after they sold more than 88,000 pounds of non-kosher meat to Jewish schools, individuals, and institutions claiming the meat as "kosher." To doctor the meat, the two admitted they bought beef cuts from discount supermarket Metro and then removed the veins and soaked it in saltwater. While the meat appeared kosher - kosher meat is always salted - the beef had not been slaughtered according to ritual slaughter laws. Regardless, the beef was sold labelled as "kosher" at a high markup. The two said that the sausages, at least, were always kosher, according to the Jewish Telegraphic Agency. The now-bankrupt Aviv kosher butchery was estimated to have made more than $710,000 in profit from the sales. It was busted in 2012, however, after investigations were launched into the fact that it allegedly sold more meat than it bought. During the proceedings, Akiwa asked for forgiveness. “I want to ask the forgiveness of everyone whose religious sensibilities were wounded,” he stated. Leslie added that he "deeply regretted" his role in the fraud. As careful as you can be regarding kashrut, once you are trusting other people to supply you with your food, you are at their mercy. All we can do is our best, within the halachic guidelines, but it is a shame that so often there are people who will take advantage of that for their profit. A reporter from Chicago was in Israel over the summer working on a couple of projects. While here, he came up with an additional idea - meeting with some Chicagoans living in Israel and talking to them about aliyah. I can't believe not a single one of them mentioned the Cubs.. The videos are not embeddable, so I will just post the links to the two interesting articles.. enjoy..
Tzaharons opening at beginning of November! I was just given permission to post this information. It just became public knowledge. You probably cannot find out this information anywhere else online yet. Good news for working parents (or other parents who want their kids in tzaharon in the afternoon)! Before the Sukkos holiday the government recapitulated on its decision to cancel the subsidies for afternoon day care due to budget cuts. They announced that after Sukkos the tzharons would begin with government subsidies. They have now released the information and sent out the letter with the details. see below. I will summarize the letters first. Petachya, the official operator of the subsidized tzaharonim, is announcing that the tzaharons will begin at the beginning of November. The programs will have an enrichment program until 3:45pm on Sundays through Thursdays, on school days (not including vacation days). The program will include a hot meaty lunch with a mehadrin hechsher, will have social and educational programming and enrichment programs. Registration for the tzaharons will take place from Sunday October 26 until Friday November 5th. Registration will take place only through the telephone hotline at 073-320-0232 between 8am and 6pm (18:00), though the hotline will operate 24 hours a day though with less staffing. Payment for tzaharon will be only via credit card. 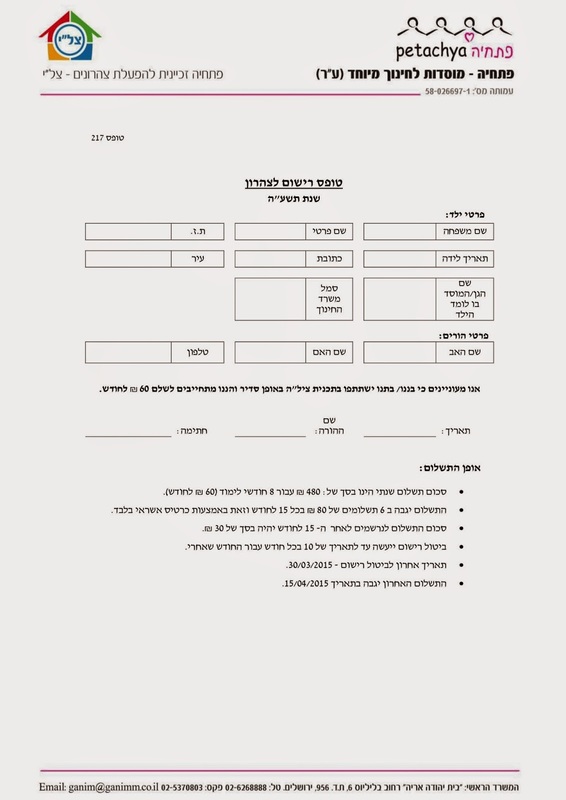 in addition to registering by telephone, you must fill out the form (2nd page below) and submit it to the head of the tzaharon when it will open. NOTE: I just saw that my daughter in the Eitz hadaas system came home with a similar note today. They are running the registration directly and sent a form to be signed and handed back in to the school. I imagine that through them the payment will be via horaat keva or however the parent already payys the school, rather than via credit card at registration. So, check with your school to see the appropriate way to register. a bunch of guys work all day long, each in his own job, on his schedule. some longer hours, some shorter hours. Some work in more physical labor type jobs, some sit at a desk and do what they do. Every single day, with no breaks - no bein hazmanim at all, just about 365 days a year (or 354 on the Hebrew calendar), these guys get together to learn. They have finished Shas together, finished Shulchan Aruch together. Tremendous dedication over a long time, to learn at night, just for an hour to an hour and a half, after an exhausting day. day in, day out. no breaks. Literally. While all other shiurim take vacations, this shiur does not. While other rabbonim go away for x amount of time and put the shiur on hold, this shiur does not - if the maggid shiur has to go away, a substitute is found. the shiur is now undergoing some changes. Some major topics were just finished, and a new major project is going to be taken on by the shiur. To plan it properly, the maggid shiur decided to take some time off, just a couple of weeks. The shiur, for the first time in about 15 years, would go on a short vacation, in order to plan the next stage properly. Before the vacation even began, these exhausted middle-aged men, who should have been excited to get a little time off, time that could be spent with family, going out at night with the wife, doing other things, checking out another shiur or a speaker on an interesting topic, or just resting, approached someone and said they would like him to fill in and give shiur, on whatever topic, during the break. They did not want the vacation. So, they got someone to agree to give shiur, and these exhausted men who set a daily time to learn, are continuing their regular learning schedule instead of taking advantage of a small amount of justifiable time off. I know all the relevant parties, and I attest to the veracity of this story. That's a story that can inspire!. Today there was a conference celebrating 10 years of the renewal of the Sanhedrin. The program of the conference looks interesting. An Arab posted a response on Facebook, and I am told it was an angry, inciteful, post, though Google Translate makes no sense so I dont actually have any idea what he wrote. The biggest surprise, to me, of this situation is that the Sanhedrin still exists. I used to follow the Sanhedrin closely. I have not heard anything from them in a very long time. I thought they just disappeared. That they are still active somehow is a surprise to me. Reachings, by Rabbi Yaacov Haber, published by his great publishing house Mosaica Press, was a bit of a surprise for me. I had expected it to be a book on the parsha and Jewish Holidays; a book of nice lessons, vortlach perhaps on the parsha, etc. Reachings is so much more than that. Reachings bases its lessons on the parsha and in the Jewish holiday cycles but it is far more than just another book on the parsha. Reachings is a book of fundamental lessons about Judaism. They are practical and understandable lessons, and they are reachable and achievable by us, the "common folk". They are not pie in the sky ideas. Reachings is made up of short essays. It begins with essays cycling through the Jewish holidays, with one or two essays on each holiday. 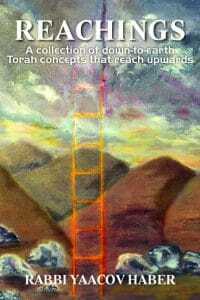 After that it moves to the weekly portion of Torah reading with essays on different fundamental lessons from that weeks portion. I enjoyed the writing style of Reachings. The essays are written in clear English and are easy to read. The essays are relatively short, each essay is just a couple of pages, and Rabbi Haber gets to his point clearly and quickly. The essays are peppered with stories, many of which were heard first hand, and not just classic old Jewish tales. I actually enjoy the stories so much, as they are chosen to enrich the specific lesson and drive home the point and they are all right on target, and have even shared some of the stories (and of course the lessons) with my family at the Shabbos table, and even just on the occasional random evening. Reachings, by Rabbi Yaacov Haber is now in its fourth printing, with the original printing dating back I think over 40 years! It must be good to have sold out so many times! A month ago the government announced that it had reversed its decision regarding the cut to the tzaharon budget and immediately after the Sukkos holiday it would return the subsidized tzaharonim, afternoon day care system, albeit with some possible changes. They even stated the date for the reversal to be October 19, the first day of school after the end of Sukkos. So, October 19 has come and gone and nary a word about any new arrangement for the tzaharons. I have searched far and wide for any such notice, but have yet to find one. I posted the question on Minister of Education Rav Shai Piron's Facebook page asking what the status of the tzharons is, but I have yet to receive a response. Working parents are still required to pay out a lot of money for private day care, for many rendering the economics of holding a job while paying exorbitant day care prices problematic and not worthwhile. - Rav Moshe Chaim Lau has now lost two chief rabbinate races in just a few months. It is clear the only reason he was imported to the Jerusalem race was because of his family name giving him a chance to win. Jerusalem has plenty of qualified rabbis. - Rav Shlesinger saved himself the loss by pulling out, though that situation was dirty. UTJ should have backed him instead of Lau considering his loyalty to UTJ leadership, his standing in the Jerusalem rabbinate, and his many years of experience and reputation. All this makes the original point clear to me that Rabbi Lau was only brought in because of his name. Perhaps all this was maneuvered in order to save Rav Shlesinger's reputation. - the entire method of rabbinic elections needs to be somehow reformed. It is too political, too dirty, and that is not how rabbinics should be determined. - the Sefardi situation is just strange, with Shas and Rav Amar's alternating cold and hot relationship. - may the winners serve Jerusalem, Israel and the Jewish people with honor and dignity. sure, teaching Hebrew to new immigrant children is important, but is it "defending" the State? I am happy Eyal Cohen has done so well..
reminds me of [reading about] the days of segregation.. separate drinking fountains, separate bathrooms, etc. 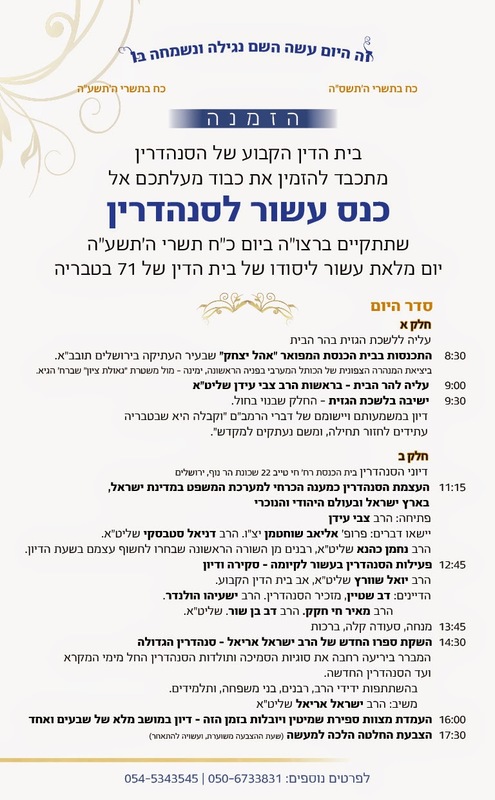 PSA: Melaveh Malka Concert for Men in Yerushalayim to Benefit Camp HASC! 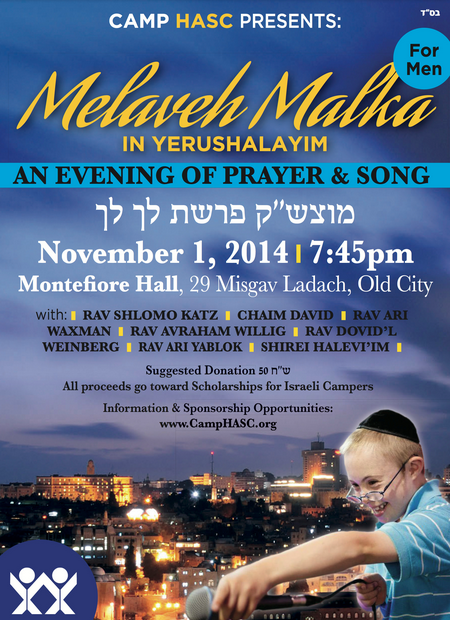 Melaveh Malka Concert for Men in Yerushalayim to Benefit Camp HASC! Your support will help us provide the unique opportunity for children from Eretz Yisrael with special needs and intellectual disabilities the opportunity to spend the Summer at Camp HASC, and enjoy all the benefits of being in a fully adaptive, therapeutic seven week sleepover camp. Pat Condell is back talking about the Middle East... I am happy we are on the right side of Pat Condell..
Pat Condell is unique. Nobody can match his extraordinary blend of suavity and savagery. With his articulate intelligence he runs rings around the religious wingnuts that are the targets of his merciless humour. Thank goodness he is on our side. Shabbat Israelit is a project sort of similar to Just One Shabbos (Keeping It Together), but is different. Instead of being about as many people as possible keeping one shabbos properly, Shabbat Israelit is about getting Jews of different stripes to share a shabbos meal together. Both projects are happening this Shabbos for some reason despite the differing objectives and messages..
Ismael Haniyeh sent his daughter to Israel for emergency treatment. Haniyeh is one of the most senior leaders of Hamas. a sign that even Hamas recognizes the need for, or reality of, coexistence? perhaps. I'd like to see something in exchange (not as thank you for treating my daughter so here is... but just like you help us, we help you). something going in the other direction. I doubt we'll see images of Israelis, Netanyahu's children for example, being treated in Shefa Hospital in Gaza, but maybe some other form of them providing us with some sort of need. Maybe letting religious people who used to live there pray in the former synagogues, or something else maybe they can provide Israelis with. Some people are all excited that Yair Lapid has started to grow a beard. Wake me up when he grows long Breslaver peyos or puts on a kippa. Otherwise I don't really find it interesting. It seems the first rains of the season, which were unusually heavy for the time of year but did not seem so major to me, caused about 6 million shekels worth of damage to Israeli agriculture. 1. they should have kept shmitta. then this damage would have been lessened, or it wouldnt even matter. 2. don't these farmers know that come October the weather changes and rain begins to fall? How come every time it rains we have to hear about how much damage it did to crops - don't the farmers expect and prepare for rain? don't they own a Farmer's Almanac? so, will all those people and governments boycotting Israel, whether as part of the BDS or in other forms of boycott groups, boycott the Ebola cure? Interesting that Rav Shlesinger, a rav worthy of the position of Chief Rabbi of Jerusalem and one I have only heard good things about, is upset that the haredi leadership is supporting Rav Lau instead of him, and has stated that Rav Shteinman is not well, doesn't understand the details and factors involved, and is unable to make such a decision. When a regular person says it about a rabbi who makes an outlandish statement, the sky falls and he is a heretic. When it becomes relevant for rabbis, they also use that argument. 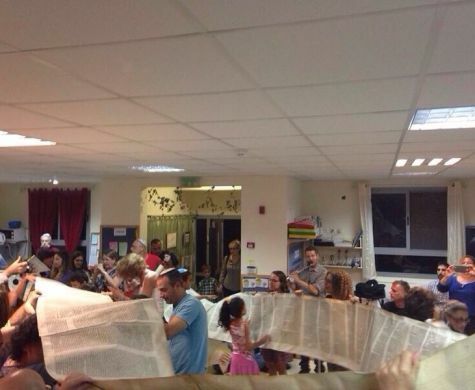 a Reform synagogue in Kfar Yona celebrated the end of Simchat Torah during Hakafot Shniyot by unrolling a sefer torah completely and removing the parchment form the scroll holder and dancing while holding the parchment among all the members. 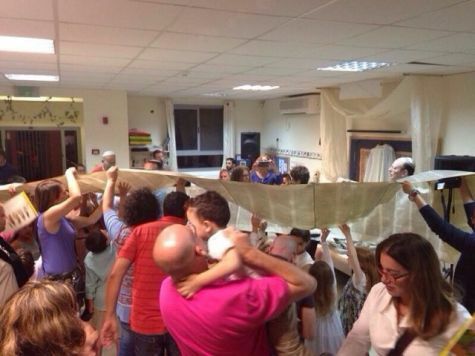 It seems this is the first time this has been done (that is known, at least), though the rabbah (female rabbi) said that they do this every year and she has seen this done by orthodox communities abroad (clearly she is lying about that). Regardless, I express my protest for this shameful treatment of the Torah scroll and my sorrow that this is what has happened. I don't think making a law against this, as has been suggested by the Deputy Minister of Religious Affairs, has any purpose, as they would just find another way to shock the public with a different act next time. One cannot outlaw every scenario, as they will always be able to come up with something else. I am just going to leave it at this. an expression of sorrow and protest.